(Items with yellow borders are active. Click within the yellow borders to link to related descriptions. When the city was enlarged towards the west, the original decumanus was extended as far as the hill of S. Martino, and it is from this vantage point looking down at "Spaccanapoli" that the effect of this division is most striking. Along this straight line are many of the most noteworthy monuments in the city, some of which are dealt with in detail elsewhere on this website. At the beginning of the original decumanus, starting at Piazza del Gesù Nuovo (image, left) at the site of the Spire of the Immaculate Virgin, the Church of Gesù Nuovo (Palazzo Sanseverino, number 2 on the map), and the Church and Monastery of Santa Chiara (number 3 on the map) and heading east, you immediately cross a street named via Costantinopoli, built along the line of the original Greek west wall of the city. Into the old city now, you pass the Filomarino Palace (#5) , which retains in its structure traces of the numerous renovations undergone during the centuries. The portal is by Sanfelice, and it is here that Italy's greatest modern historian and philosopher, Benedetto Croce, lived and worked. Further on, at Piazza San Domico Maggiore is the Church of the same name. The church has been altered several times and has lost its original 14th century appearance, but it still retains the Gothic doorway and wooden door. Attached to the church was the convent which the Dominicans transformed into a center of study and culture and where Thomas Aquinas taught. Inside the church is the 13th century crucifix that tradition says spoke to Aquinas. Immediately after Piazza San Domenico Maggiore is the small Piazzetta del Nilo. Here was the Alexandrian "Egyptian" quarter of Greek Naples and the ancient statute of the river Nile, venerated by the Alexandrians, is still to be found there. Here is where the ancient Temple to Isis probably stood. The modern street now takes the name of via S. Biagio dei Librai (book-shops); as you continue, the Palazzo Santangelo is on the right, erected by Diomede Carafa in the middle of the 15th century. It is one of the most interesting Renaissance buildings in Naples, containing elements of Florentine architecture mixed with others of Catalan derivation. The decumanus now crosses via San Gregorio Armeno, famous for the church of that name (# 27 on map). It is one of the oldest in Naples, built on the site of the ancient Temple to Ceres. For centuries the street has been well known for the figurari who have their workshops here. These are the artisans who construct the small figures and models for traditional Neapolitan Manger scenes at Christmas. Spaccanapoli then crosses via Duomo, just south of the Cathedral (Duomo) (opposite n. 31 on the map) and finishes shortly thereafter as it passes the line of the old Greek east wall. You can enter the main east-west street of the Historic Center of Naples from Piazza Bellini (see #43 on the map). 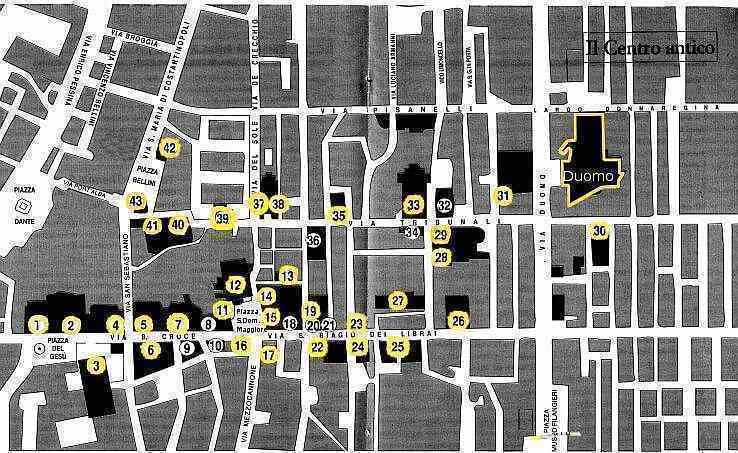 A few yards south of the excavated ruins of the old Greek wall is the Naples Music Conservatory (#41 on the map). Conservatories, themselves, go back to the mid-1500s in Naples, when the Spanish opened a number of them in the city on the premises of various monasteries. The location of this particular conservatory is the result of a consolidation undertaken in the early 1800s under Murat. It is actually housed on the grounds of what used to be the monastic courtyard of the adjacent church, San Pietro a Maiella. This is the approximate location of a gate in the western wall of the original city. Farther along on the left as you leave the church of San Pietro a Maiella is the church, Chiesa della Croce di Lucca, originally (in the first decade of the 1600s) part of a larger monastic complex. The construction of the main University Hospital on that location made it necessary to tear down much of what was on that site. Beyond that on the left are the Church of S. Maria Maggiore and The Pontano Chapel (#37 and 38, respectively, on the map). The Pontano Chapel was built in 1492 at the behest of Giovanni Gioviano Pontano, the most celebrated Neapolitan humanist of the day and often referred to as the last great poet in the Latin language. He was an early member of The Academy, a group of scholars founded in Naples under the Aragonese dynasty. Because of his great influence, the group became known as the Pontanian Academy. Adjacent to that chapel is Church of S. Maria Maggiore. It was built in 533 and is one of the Paleo-Christian churches in Naples (click here for a related item). It is on the site of an earlier temple dedicated to Diana. The remarkable red-brick belfry on the grounds is the oldest free-standing tower of its kind in Naples. It was part of the original church complex, though built later (c. 900 AD). The base of the tower incorporates earlier Roman bits and pieces as construction material, some of which are said to be part of the earlier temple. The more modern appearance of the church is due to the reconstruction of 1653. Just beyond the Palazzo Spinelli di Laurino (#36 on the map) and also on the right is a building that often goes unnoticed. If you stand back and look at it, you see that it is one very long structure, extending almost all the way to the next intersection. The unity of the building is hard to see at first, broken up, as it is, by numerous small stalls and businesses behind the row of arches that fronts the street. It has also been sub- and resubdivided into many private residences on the floors above. However, it is, indeed, a single building, built in the mid-1300s to be the residence of Phillip II of Valois (also 'of' Taranto and 'of' Anjou) brother of the Angevin King of Naples at the time, Robert. The building still bears the impressive title of Palace of the Emperor of Constantinople, from the fact that Phillip married Caterina di Valois, who had inherited that title from her father. The presumption in the title bears no relation to real life in the mid-1300s; Neither Phillip, nor his wife, nor her father ever ruled Constantinople. Across the street from that huge building is a small church (#35 on the map), the Church of Purgatorio del Arco, notable for the various examples of the "memento mori" --decorative skulls and bones and other such "reminders of death" built into the facade as admonitions to worry about the hereafter. They were put there in the early 1600s by architect Cosimo Fanzago. Such was the obsession of the congregation with souls in Purgatory that, at one time, 150 masses a day were held. Just before you get to the large Church of S. Paolo Maggiore you can turn in to the left and take a tour of Underground Naples. You will descend into the Roman aqueduct system that supplied the ancient city. Via Tribulali now crosses Via San Gregorio Armeno (described in the last paragraph of the section, above, about the lower Decumanus). This is the main crossroad of the ancient city. The Church of S. Paolo Maggiore (#33 on the map) is the most prominent building. Across the street are the Church of San Lorenzo Maggiore (#29) and, below that, the Excavations of S. Lorenzo Maggiore, the only large-scale excavation of the ancient city that lies beneath the surface of modern Naples. Continuing east in Via dei Tribunali leads you past a large white church on the left. It is the church of S. Fillipo Neri of the Gerolamini order. The Neapolitan philosopher, Giambattista Vico, lived at number 112 in the square in front of the church from 1704-18, and his remains are interred within the church, itself. Continuing beyond that crossing along Via dei Tribunali will lead you to Via Duomo, near the Naples Cathedral.